"Why won't you defend yourself against what Laura from "Last Days Ministries" says against you? 0:52 'I don't preach me' AMEN! 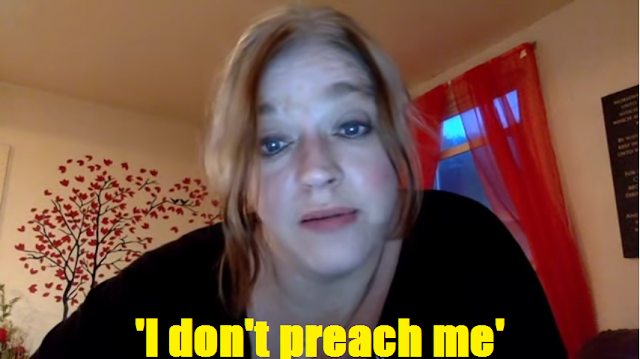 There is NO gospel of Hans S, there is NO gospel of Renee Roland, there is NO gospel of Laura from "Last Days Ministries", there is NO gospel of Robert Breaker etc. ^through the shed BLOOD of JESUS! Paul revealed to us a NEW gospel (of Grace) on behalf of JESUS and JESUS had given him the AUTHORITY to call it MY GOSPEL! At the day when God shall judge the secrets of men by Jesus Christ, according to MY Gospel. If someone BLOCKS me they're NOT my FRIEND and Wayne Crook can speak for himself, but I gave you my OPINION. JESUS will NEVER BLOCK ME!!!! Are you SURE JESUS won't cast you into His eternal DETENTION CENTER, the lake of fire and are you SAVED FOREVER by His GRACE through FAITH alone in His ATONING BLOOD and His RESURRECTION from the DEAD and DO YOU LOVE JESUS CHRIS, God manifested in the FLESH/SINLESS HUMAN CAPACITY? We should NEVER follow fellow (saved) SINNERS with ONE BIG EXCEPTION: the Apostle Paul! There is NO gospel of Hans S, there is NO gospel of Wayne Crook, there is NO gospel of Renee Roland, there is NO gospel of Laura from "Last Days Ministries", there is NO gospel of Robert Breaker etc. Do you belive in the "Inclusionism gospel" ? Do you belive as Gnostic Paul Woodward teaches, we all pre-existed? Do you belive the Jesus was literally slain before the foundation of the world? Do you love JESUS Christ, God manifested in the flesh and why do you use a picture of a witch https://yt3.ggpht.com/-Pnc_qHu0BEA/AAAAAAAAAAI/AAAAAAAAAAA/weOALUoyA-Q/s288-mo-c-c0xffffffff-rj-k-no/photo.jpg as your profile picture and this picture https://yt3.ggpht.com/ruwJuPYLNZfMkYPfwnsk9fvrkC6NmLMhgdXTdPgbrHxcdKF3pbvxK0PCHx9kPIFatgDVHCkHgpw=w2120-fcrop64=1,00000000ffffffff-nd-c0xffffffff-rj-k-no on your channel? "You do you........I'll do me......."
And then you find out that these people are all on government assistance.......their all on medication, they got way too much time on their hands and just about nothing going on from one day to the next. I heard from someone today that when Paul calls Christ the "propitiation" i.e. mercy seat in Romans 3:25, that it had nothing to do with being a substitutionary sacrifice.....wth. We should never be afraid to answer those who criticize us with constructive BIBLICAL criticism and those who commit AD HOMINEM (Latin for "to the man" or "to the person") attacks are always acting from the FLESH, which is SATANIC! Let's follow PAUL on behalf of JESUS! Renee Roland I never seen the answers. I only can found replies where you evaded my questions. And no need for video chat.. They are three simple questions. John Hind, and forgive me that I first thought you were some troll, but you're a brother in JESUS Christ! Yes, JESUS will NEVER block us and we will NEVER block each other in eternity!